The LaserPET™ (Personal Electronic Target) is a standalone advanced laser training reactive target. The LaserPET allows shooters to practice fundamental drills by engaging a target anytime, anywhere. Combine the LaserPET™ with any red/visible SureStrike™ Laser Cartridge, for quick, easy and portable practice that does not require a computer. This highly mobile target can be easily moved and setup for different scenarios in your home laser training range. This smart target helps improve your shooting skills with different skill modes. 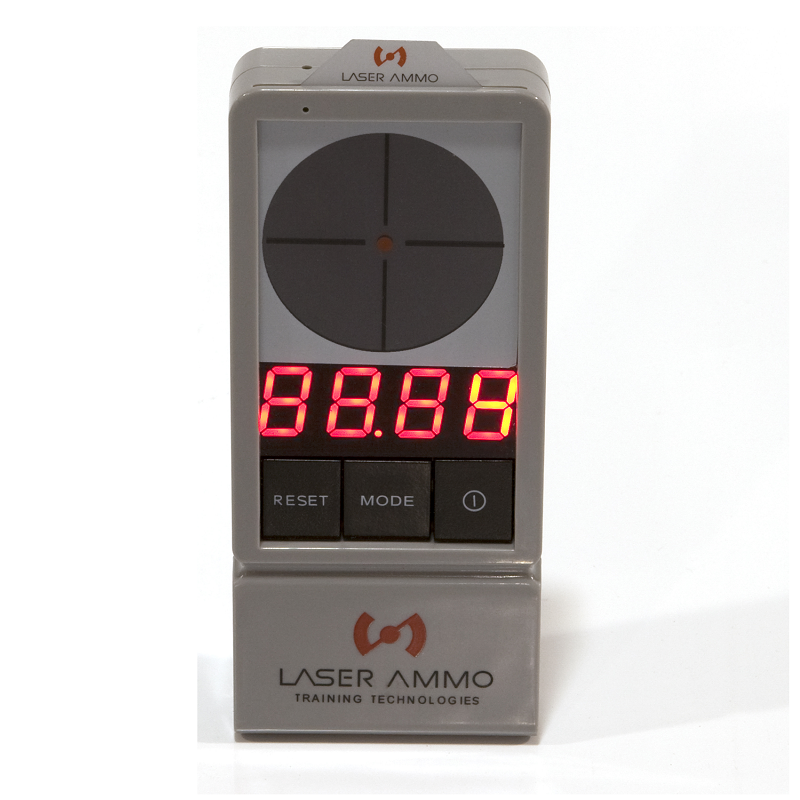 The LaserPETTM can keep track of hits, act as a shot timer, and even help shooters speed up reload times. It also gives the shooter instant audible feedback when a hit occurs on the easy-to-read screen. The LaserPET™ will improve your reaction time, shot time, accuracy and will continue to enhance your shooting skills with four operational modes and five interchangeable target cards. It pays itself off in two range visits, & could save your life. I'm amazed there's no reviews here on the home site. There's tons of 5 star reviews on Amazon, and a measly 2 reviews less than 4 stars, and those two people clearly misunderstand the application of this training device. Because of those excellent reviews, I purchased the unit. I wish I could properly convey the absolute necessity of this LASERPET training target. A necessity unknown to me until I started using it. I figured it would just be more fun than simple dry firing with the red caps (and it's absolutely more fun, by a huge factor, but it's so much more than just fun). There's 4 modes to choose from, each rapidly honing a specific skill, extremely useful whether for competitions or real self-defense scenarios. It's pocket size portable, only takes seconds to setup, and the various target options can be swapped with a swipe of your hand. I recommend this even if you have a backyard range, and an eternal supply of free ammo with which to practice. In the time it takes you to get setup on your backyard range, you could have already fired 50 practice "shots" indoors with this trainer. With the auto reset trigger unit now offered by SureStrike, you could have fired 150. With just 5 or 10 minutes of practice each day, the LASERPET Electronic training target has improved my abilities 10x more in a single year, than the previous 5 years of twice weekly range visits. Obviously I still go to the range, but only once every week or two, and my skill on paper has increased in constant parallel with the skill during this laser training. Eye control, breath control, stability, trigger squeeze, muscle control, strength and memory.